I should say that the photos of the scoreboards don't do it justice. My shutter speed was not set properly to take advantage of the amazing picture of these screens. Fans will love the new scoreboards. Media day photo sets elsewhere: AnnArbor.com, MVictors, Detroit News. Of course, Tim from mgoblog has the details of today's Brady Hoke presser. Video lives here. 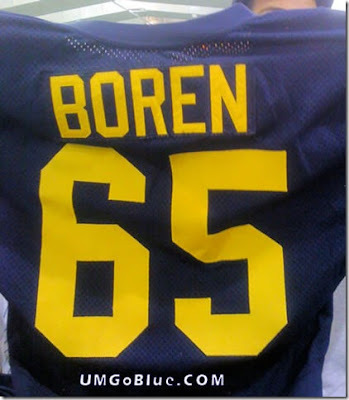 Props to Phil from UMGoBlue.com who got there early today for the UM garage sale, and saw a Justin Boren jersey, which by now has been sent into the wild for the modest price of $50. If anyone knows who bought this and what they plan to do with it, I'd be very interested to find out.